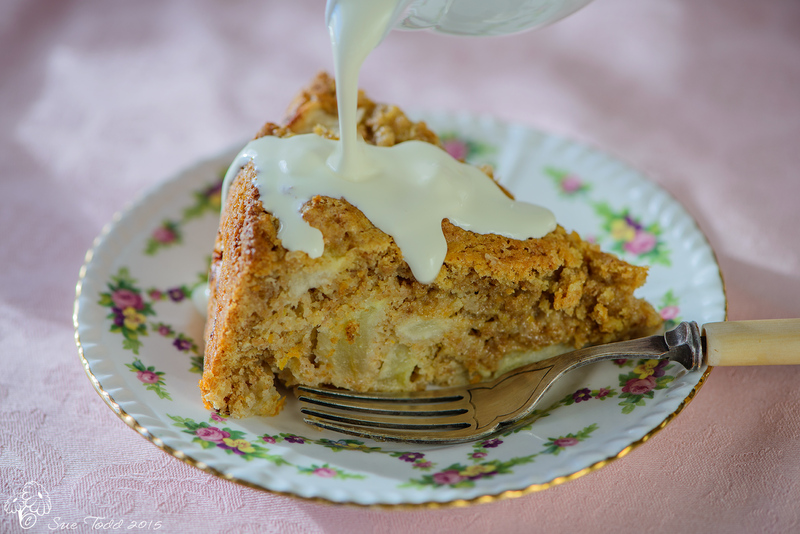 This Somerset Apple Cake is my “go to” comfort cake. It’s not hard to make, and is soft, scrumptious and mouth-wateringly good whether you have it straight from the oven with cream or have it cold later. I’ve been known to eat this for breakfast with a hot cup of coffee, it makes a lovely decadent start to the day. However if you’re after a ‘pretty, knock-em dead sort of looking cake, this isn’t the way to go, this won’t provide your heart’s desire. 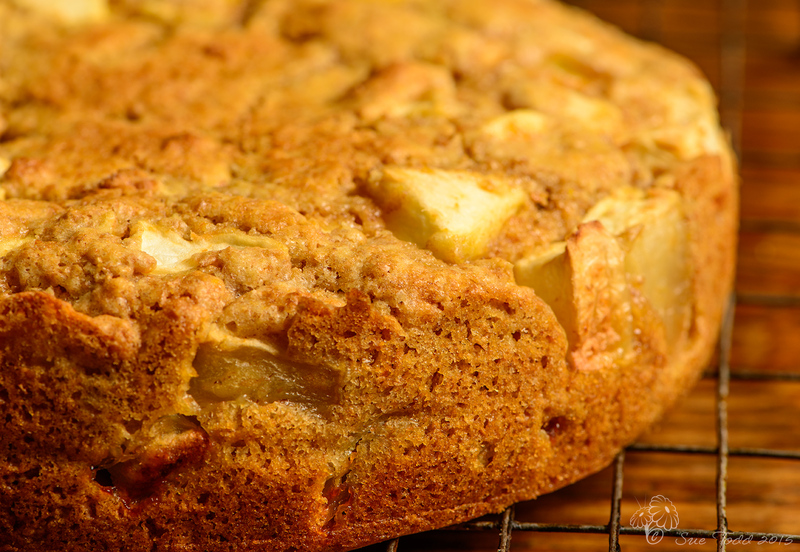 This Apple Cake is a rustic, wholesome fill you up and make you feel good cake. This recipe is adapted from an old recipe in my very old, battered and much used copy of Farmhouse Kitchen. I’d forgotten about the TV show that went with this series of books, until I went to look the book up on Amazon. It featured on daytime TV from Yorkshire Television along with other favourites like Watch With Mother. Whatever happened to good day time TV? Now we have Jeremy Kyle?? Perhaps I’m getting old? I know what I’d prefer to see and it’s not Jeremy! Somerset Apple Cake and Cream, © Sue Todd 2015. However I digress. Back to Apple Cake. The original recipe uses candied peel, white flour and insists on Bramleys. Bramleys do work really well in this recipe it I have to admit, but I’ve also used whatever apples I have to hand and it’s always come out okay, though sometimes it does need a bit longer in the oven, and even then it can sink a little in the middle. Though in this case it adds to the rustic charm and the gooey centre is just lovely. My version uses wholemeal flour, vanilla sugar, and some extra vanilla (you can’t get too much of a good thing after all), while omitting the dried peel. The original also used a sprinkling of granulated sugar on the top. I don’t have any of that in my kitchen, so its my vanilla sugar that I use here, plain unrefined castor sugar will do just as well though if you have no vanilla sugar. I know I already explained this, but It’s not a pretty, decorative cake, it’s a wholly functional, rib sticking autumn/winter goodness on a plate kind of cake. Actually I think this one works anytime and it’s totally scrummy comfort food at any time of day or night, hot or cold. 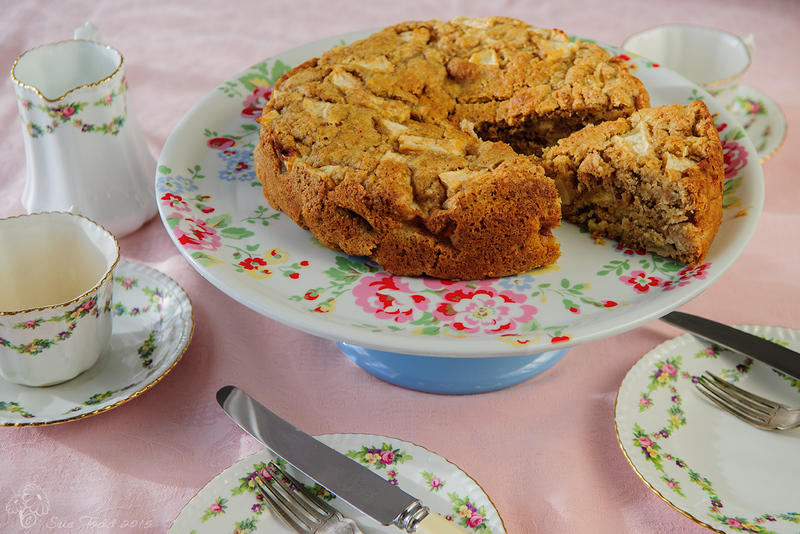 Somerset Apple Cake © Sue Todd 2015. If you are using a conventional oven, pre-heat to 350F/Gas 4. Grease and line a 9 inch cake tin. Cream the butter, sugar and orange rind together beating until the mixture is light and creamy in colour. Mix 1 tablespoon of your self-raising flour in with the chopped apples in a bowl. Generally I have pieces of apple that are about 1-2cm in size, Gary chopped the apple for this one, so its a good bit bigger, still yummy though. Now add the eggs and milk into the bowl with the creamed butter, sugar and orange rind mixture. Add the rest of the flour and the apples to the mixture now and mix it up well. Once its all combined, transfer the mixture to your prepared cake tin, smooth over with a palette knife and sprinkle a tablespoon of vanilla sugar over the top. It will need 40 to 50 minutes in the oven and indeed depending on the sogginess (is that even a word?) of the apples it may need a bit longer. Test it with a metal skewer, it does tend to be a moist cake anyway with those hunks of apple in it, but you will want to ensure its cooked through. Having said that I don’t mind it a wee bit soggy in the centre, especially when its warm from the oven. I use the baking oven of the AGA. If it starts to brown too much, pop a cold tray in above it, just to stop it from browning too much. I don’t think there is a time of day or year that isn’t appropriate for apple cake. 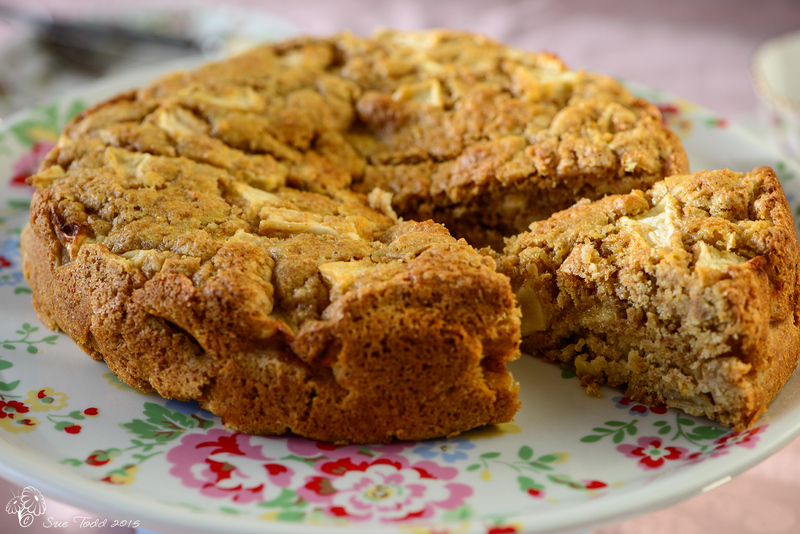 This apple cake is just delicious, you can eat it as it is, but its lovely with cream, ice-cream or even custard. It makes a great dessert, its fab with morning coffee in the garden in summer, with afternoon tea by a roaring log fire in winter, or in large hunks for a picnic, and, as I mentioned earlier it’s also nice for breakfast or as a late night snack (I’m guilty on both counts!). Enjoy! This entry was posted in Cakes, Recipes and tagged Apple, Apple Cake, Baking, Cake on February 11, 2015 by Sue Todd. Pingback: How to make Vanilla Sugar. Doh, I should have gotten this up earlier as planned Helena and saved your apples!! Thanks 🙂 Hope you have a lovely weekend, thanks for the very kind comments and I hope you try and enjoy. Ours is all gone now 🙁 Trying to work out whether to do another or make ginger cake next…. This is not Somerset Apple Cake. Somerset Apple Cake has cider and raisins!! I guess there’s lots of varieties of all kinds of recipes Sally. I’d love to know more about your recipe with cider and raisins though, that sounds fab!